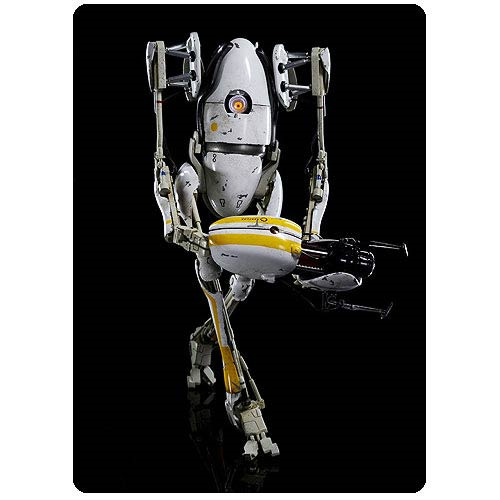 Shopping for Portal Action Figures? Ready to traverse the Half-Life universe? Testing robot P-Body is now an amazing 1:6 scale action figure! Directly out of the Portal 2 video game. Features LED lights, tons of detail, articulation, and the signature Portal Gun! From arguably one of the most popular video games of 2011, Valve's puzzle-platforming Portal 2, comes one of the co-op duo testing robots - P-Body. The Portal 2 P-Body 1:6 Scale Light-Up Action Figure is equipped with its signature in-game Portal Gun, fully removable and complete with LED lights and production-accurate parts! P-Body measures approximately 12-inches tall, made of plastic, and requires 1x "CR-2030" button-cell battery for the light-up optical sensors and 2x "SR626SW" button-cell batteries for the light-up Portal Gun. Ages 15 and up. Originally designed as co-op only characters, ATLAS and P-Body have since gained a popularity all their own, allowing players to traverse the Half-Life universe as autonomous life forms created by the malicious computer, GLaDOS. This is the very first collaboration from indie figure maker threeA and innovative gaming company Valve, and it's sure to be an event celebrated by fans around the world. Don't miss out on your chance to own a piece of video game history!